… and even more excited for the year to come. The end of the year is typically viewed as the time to stop and reflect on what has been accomplished over the last 12 months. Databox has matured and become a true mobile-first business analytics platform. Although we had a bit of a slow start, we added a bunch of new integrations, some key functionalities and improved the stability of the platform. By changing our business model to a freemium, we continue to see growth and making adjustments to our new strategy. We added more than 20 new one-click data connectors this year, including: HubSpot, Google Ads, Facebook Ads, Intercom, Mixpanel… mostly aimed at marketers. Although we have nearly 40 connectors available, there are still 100s of other applications where you may store your data. But never fear… because you can get data from other systems into Databox as well! 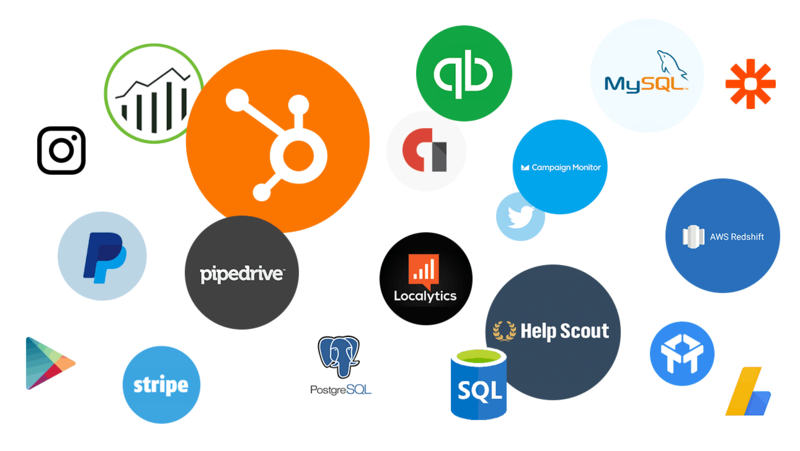 With Databox and Zapier integration, you are able to access more than 600 different data sources. For everyone else, who might have their data in some kind of SQL database, we added a few SQL connectors that will help you get data from Amazon Redshift, MySQL, PostgreSQL and also allow you to use our API to push custom data. For 2017, our plan is to go a bit deeper with a few data sources and deliver even more valuable insights. Although Databox is a mobile-first platform, we believe data should be accessible anytime and be 100% device agnostic. With increased adoption, several users asked for access to their key metrics from their desktop, especially while they are sitting in front of their computers. This was one of the main reasons why we added desktop support. If you are using Apple Watch, you are now able to see key metrics on your wrist and get notified when some alerts are triggered. And if you are spending a lot of your time using Slack, (like we are here at Databox), you’ll be able to access your metrics right within Slack. Last but not least, we are continuously delivering a great mobile experience to our iOS and Android users. We’re really excited about this functionality – the ability to set goals in Databox. We believe this will be a game changer. 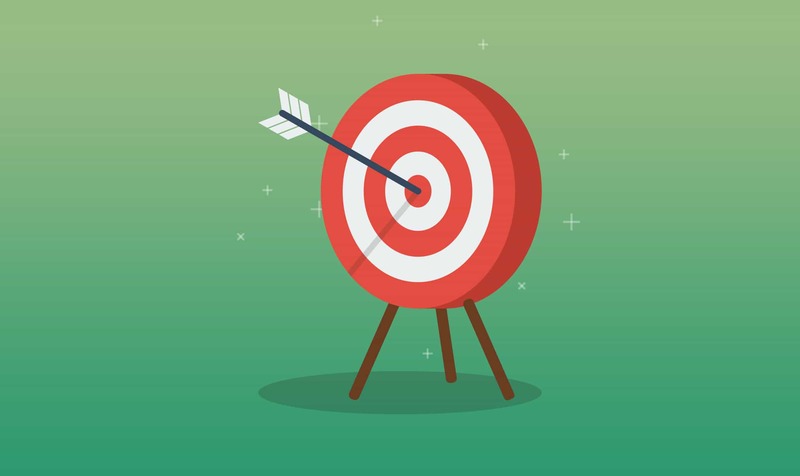 By setting SMART goals, you’ll be on the path towards achieving the growth your company wants. By tracking your progress, you will immediately know how your activities correlate to your aims, and will be able to adapt quickly to ensure you achieve the outcomes you desire. If you haven’t yet, you should set a few 2017 goals for you and your company within Databox. It’s easier to achieve goals and you’ll be able to see and track growth in ways you hadn’t thought possible before. This year we grew… a lot. We added more than 6,000 new companies, from 177 countries. 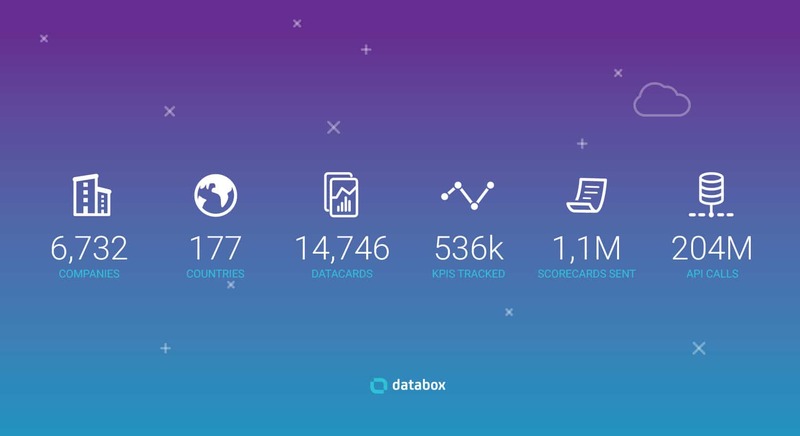 By tracking more than 200M data points and delivering more than 1M scorecards, this is a really exciting time for us. We still don’t have anyone on our sales team and are very aligned with something our friends at Drift are saying – “Helping is the new selling”, so we’ll try to grow our business that way. We care about our customers and almost everyone on our Team is constantly having conversations with them. One day it’s Sarah, from one of the Fortune 100 companies, the next day it’s Mark, from a small digital agency, who needs help with customizing a few metrics. We treat everyone the same. We don’t separate customers based on their size; we view them all the same, and some of them have even become our friends! We want to respond as quickly as possible, to help them solve challenges and help them achieve their goals faster. We have learned a lot from everyone of you over the last 12 months and in many instances, you’re our key inspiration. We are thankful for where we are, thankful for every day we can talk to our customers and help them achieve their goals. Plain and simple, we are passionate about what we do … and demonstrate a similar love for helping other people measure their business and achieve their goals faster. Inspired and energized by 2016, and even more excited for the year to come, we will continue to remain focused on helping digital marketers achieve their goals faster. Besides continuous support for adding new data integrations, we’ll introduce our Partner program, add support for building and sharing templates and so on. Stay tuned! A ton of new and exciting things on our plate for 2017. We wish you a pleasant holiday season and nothing but the best in 2017.